Mandee Labelle, yoga teacher, writer, lover of life. The Yoga tradition is a way of life and a practice. Its richness offers a broad palette of tools and techniques for the human body & mind to help it realign and harmonize. Many who have walked this path have passed along their knowledge. There is a vast array of traditions within the tradition to choose from, all pointing to ways to help us find lasting happiness and well-being. Astounded by yoga since I fell upon the path, discovering this deep and rich method that seems so wide-ranging and applicable to so many of life’s infinite expressions. I just loved yoga from my very first class. It wasn’t long after first discovering, I went on to take it deeper having stumbled upon a comprehensive teacher training course that captured my interest and fascination. 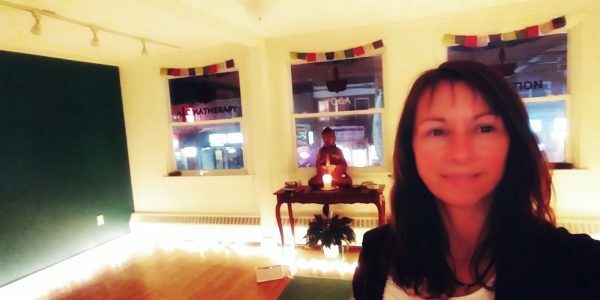 Ever since certification, I evolved to combine the art of psychology and working with people in a therapeutic way with the techniques of yoga, and offered this blend in my weekly classes to people from all walks of life. I have learned so much from being able to dedicate my life to this path, and in turn share the joy of the ongoing discovery process with others as I go. Yoga has been a gift within the gift of life. Her early studies of yoga were rooted in rich and comprehensive study of the 9 yogas through the Chakra Yoga Centre. This broad based training included and went beyond the study of Hatha Yoga (the physical practice). It included the study of pranayama, yantra, mantra, bhakti, and laya yogas. It had a strong focus on raja yoga as a form of concentration techniques, kriyas, breathing techniques that could take years to learn, let alone practice. All these techniques to help those interested in coming to know and work with mind. It was a very deep and rich immersion into yoga as a way of becoming aware of energy and ways to work with it. The Chakra Yoga program itself was passed down from Yoga Master Teacher David Goulet, assisted by Marina Halleran. After spending considerable time in India with Swami Gitananda in 1971, David came back to the West to develop his practice and offer his teaching. His teacher, Swami Gitananda was a medical doctor whose yoga lineage derived from the ancient Sat Chakra Nirupana (1526CE), so the practice of Chakra Yoga was steeped in knowledge and ways to bring great health and healing to the body, while including the wisdom of the knowledge of the Chakras. To this day, David specializes in healing programs for Cancer, FM, MS, and many other conditions of the body with his advanced breathing, sound healing, and energetic techniques. This lineage focuses on all the ways we CAN keep ourselves healthy and vibrant as we sail the electromagnetic ocean of our lives. It was in 2011 that Mandee met Francis Lucille. This serendipitous meeting marked a moment of deeper discovery. It sparked a shift and since then, has become a continual, joyous discovery process. In her weekly classes offered currently in Dartmouth NS, the focus is more of a blend of fun flowing hatha yoga, with a love of the direct path in the background in the tradition of Jean Klein and Francis Lucille. But one way or another, the simplest way to describe Mandee’s classes is that they are essentially about coming home to yourself. We are all doing that in our own way, in our own time, and there are many ways to support that process. Yoga is one way. In 2014, Mandee developed the Yogaheart Yoga Teacher Training. The YYTT arose out of interest from the students to see what was possible. The Yogaheart YTT emerged from a desire and a vision that there could be a supportive system that would support the transformative process that learning to teach yoga elicits. Up to the current day, Mandee offers Yoga in the coastal province of Nova Scotia, Canada. Following the flow of creativity, she teaches weekly classes, ytt, private in-home sessions, Skype sessions, workshops, walks, talks, retreats… and who knows? The possibilities are endless when you are doing what you love. Yogaheart was founded in 2001 by Mandee Labelle E-RYT500, and in 2014 Yogaheart grew into a Yoga School that now offers classes, teacher training, workshops and specialty programs, as well as continuing education for yoga teachers.